Table runner There are 12 products. 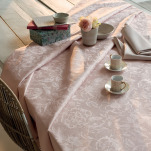 Tablecloth, table runner and napkin in 100% cotton, 220 gr/m². Drawings: plants, butterflies and sun in the anise green color, framed by blue and green. Anti-stain treatment (except on napkins). Square tablecloth (NC), rectangular tablecloth (NR) and table runner (CT) sold by the piece, napkins (4S) 55x55 cm sold by 4 pieces. 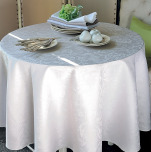 Tablecloth, table runner, placemat and napkin in 100% cotton, 220 gr/m². Drawings: flowers and wild leaves : green, blue, mauve, eggplant and turquoise. Square tablecloth (NC), rectangular tablecloth (NR), round tablecloth (NO) and table runner (CT) sold by the piece. Napkins (4S) and placemats (4set) sold by 4 pieces. Also available in coated cotton (../E). 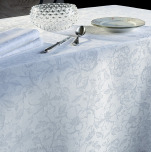 Tablecloth, table runner, placemat and napkin in 100% cotton, 220 gr/m². Drawings: flowers and wild leaves : blue and gray. Square tablecloth (NC), rectangular tablecloth (NR), round tablecloth (NO) and table runner (CT) sold by the piece. Napkins (4S) and placemats (4set) sold by 4 pieces. Also available in coated cotton (../E). Tablecloth, table runner and placemat in 100% cotton, 220 gr/m². Drawings: pastel geometric shapes: yellow, orange, red, pink, blue, green, mauve, turquoise. Square tablecloth (NC), rectangular tablecloth (NR) and table runner (CT) sold by the piece. Placemats (4set) sold by 4 pieces. Also available in coated cotton (../E). 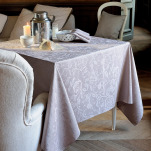 Tablecloth, table runner, placemat and napkin in 100% cotton, 230 gr/m². Drawings: pink butterflies and medallions, framed by green and pink. Anti-stain treatment (except on towels). Square tablecloth (NC), rectangular tablecloth (NR) and table runner (CT) sold by the piece, napkins (4S) 54x54 cm and table set (4SET) 39x54 cm sold by 4 pieces. 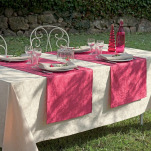 Tablecloth, table runner, placemat and napkin in 100% cotton, 230 gr/m². Drawings: light gray butterflies and medallions, framed by green. Anti-stain treatment (except on towels). Square tablecloth (NC), rectangular tablecloth (NR) and table runner (CT) sold by the piece, napkins (4S) 54x54 cm and table set (4SET) 39x54 cm sold by 4 pieces.